Final Fantasy XII: The Zodiac Age, an HD remaster of the Japan-exclusive Final Fantasy XII: International Zodiac Job System, is just some days away. It’s been almost 10 years ever since this Japan-exclusive game first came out, and finally, the Western audiences will be able to play it. 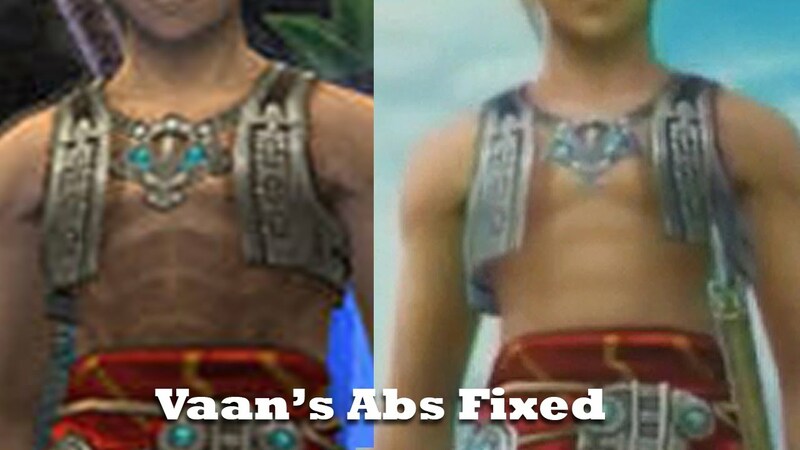 Although it will add new gameplay features to the ones we have already seen in the original game and revamp some visual aspects (like Vaan’s abs, thank God! ), the game itself won’t change, allowing veteran gamers to re-enact their previous footsteps from their first run on the PlayStation 2. That’s why, to celebrate the upcoming Western release of The Zodiac Age, here are some tricks that I came to learn during my newest playthrough several months ago, that might come in handy for you! Should you be a Final Fantasy veteran, maybe you won’t be a stranger to them. However, if you’re new to the Final Fantasy realm, they might be of your interest! When I replayed Final Fantasy XII some months ago, I wasn’t aware of this super useful trick during the beginning of the game, so I want to mend my mistakes by sharing it with you. Once you control Vaan and finish the Wild Tomato hunt, save some money and buy as many phoenix downs as you can. Later, go to the Dalmasca Westersand and let yourself be hit a little bit ‘till Vaan’s max health reduces to 10% or below. This is the only way you’ll be able to make Dustia, a rare game monster, appear in the Corridor of Sand section, and which is worth 1104 EXP and 3 LP after its defeat. Not so bad for the first minutes of the game! Before you go into the Corridor of Sand area, change your battle settings and turn the battle speed as slow as possible. Now, go into the area, remain close to the exit line and wait. Dustia should appear after some seconds, and once it does, immediately throw it a phoenix down to defeat him, grab its loot (if possible) and get out of the section before the EXP and LP gain text shows on the screen. This is the only way Dustia will respawn in the area and keep the chain unbroken. Should you run out of phoenix downs, you can always visit the desert merchant on the very west to keep your chain active. Level up as much as you want; once you meet the other party members of the game, their levels will have increased too! Many thanks to xAshe10x useful tip! Gamers overall have some sort of mixed feelings towards EXP gaining in RPGs. Some people like it the old-fashioned way, mostly because of ethical and the bragging rights that come with it. Others, however, prefer the Devil’s way and search for a method to avoid what’s understandably a tiring thing. Such is the way that we, the gaming sinners, have chosen sometimes. Final Fantasy XII’s gambit system makes it possible for your characters to think in your stead and it’s possible to leverage this for your profit in the Stilshrine of Miriam. If you were like me, who didn’t know of the Dustia rare game at the beginning of the game, you can still level up your characters with the Negalmuur rare game in the Ward of the Sword King area up to level 70 – or more! The best part of it? You won’t have to move a finger at all! Ally – HP < 70%: Cura. Foe – Highest MAX HP: Haste. Foe – <3000 HP: Attack. Self – MP <10%: Charge. Ally – HP < 60%: Curaja. With these gambits, your characters will continuously attack Negalmuur’s summoned zombies, but not Negalmuur; himself. This way, he will keep summoning infinitely! I’ve tested this trick myself and I am quite satisfied with the results. I was able to raise my characters by 10 levels in three hours (they eventually became four or five then my party was around level 60, 70 and 80), and I even left my console unattended several times due to the gambits. However, this is something I don’t recommend, as at times the decoy effect on the supporting characters will wear off and Negalmuur will be able to kill the player character almost immediately, pausing the game and dramatically cutting the flow. I recommend that you execute this trick only when you’re at home, doing chores, reading a book, whatever, so you can check the screen every now and then. Thanks to 9robin3 for this trick! How To Defeat Yiazmat, Camper Style! Anyone who has played Final Fantasy XII will cringe at the sole memory of the dreaded Yiazmat, the most difficult Hunt Mark of them all, though not say the most difficult boss in the whole game (yes, even more than Omega Weapon!). Legend says that you need to overpower yourself, your equipment and your magick to stand a slim chance against him. Rumors, however, speak of the unspeakable name of…cheating with Darkra! Again, in order to face Yiazmat, you need to be around level 60 (I personally recommend you to be 80), three Ruby Rings and Black Robes, and only one gambit: Self: Darkra. Send whichever character you want to face Yiazmat first, all alone. Immediately cast Reverse on you, so the physical damage you receive results into healing points. Maneuver Yiazmat ‘till it’s close to the wall and start throwing Hi-Ethers to it; with Reverse on play, instead of healing his magic points, it will deplete them. Do this ‘till it loses 999 MP. Now that Yiazmat’s close to the wall, immediately run and hide behind of it. Bring out the other two characters and make one of them attempt to attack Yiazmat, while his gambits are off. This will make him just stand on his position and not run towards Yiazmat (we don’t want that! ), and at the same time will make Yiazmat unable to recover his HP because he’ll be continuously in combat mode. Because everybody will be wearing the Ruby Rings, you’ll have permanent Reflect status from the very beginning; that way, and once you turn on the Darkra gambit, your characters will endlessly cast Darkra on each other, and the spells will bounce onto Yiazmat (Yiazmat’s weakness is the Dark element, by the by)! For a greater effect, you need either Black Robes or Zeus Maces equipped, and your characters need to keep a certain distance to each other so the spells can bounce thrice towards Yiazmat. And if you’re on a good level, with the Spellbreaker augment, and with the Zeus Maces or Black Robes on, each hit will land 9999 damage! Unlike the Auto-Level trick from above, you cannot leave the game unattended this time because the non-caster character’s action, sooner or later, will be canceled, and you need to manually make him attack once more. Don’t worry: if you did everything correctly, chances are that this battle will be over in just two hours. Shout out to aetithjnsw for this trick! Don’t Forget The Zodiac Spear! Ah, the legendary Zodiac Spear – one of the most powerful, and yet so easy to miss, items in the whole game. More than a dirty cheat, I want to close up this list with the Zodiac Spear, as a reminder of those who have fallen victim to their blissful ignorance. However, if you’re new to Final Fantasy XII, then you really need to read this before you go and get your new game. The Zodiac Spear is the game’s most powerful weapon and you can obtain it after you get the Dawn Shard, if you brave yourself into the depths of the Necrohol of Nabudis…only if you remained abstinent from your greed. Treasure chest in front of Old Dalan’s house (Lowtown Rabanastre). Treasure chest in the southernmost corner of Cellar once you sneak into the palace and before getting to the Goddess’s Magicite (Rabanastre Palace; I recommend you to not open any chest in this area, though, just in case). Middle treasure chest of the ones you find in the Nalbina Dungeons’ Confiscatory, where Vaan, Balthier, and Fran regain their equipment (Nalbina Dungeons; again, I recommend you to not open any of the chests). Treasure chest among the 16 chests placed in a grid in Phon Coast’s Vaddu Strand. It’s only one, but most guides recommend you to not open any just in case because it’s hard to pinpoint which one is (Phon Coast). If you didn’t open any chest when you reach the Salikawood, congratulations! You can go and reclaim now the fruit of your abstinence! Just remember that the Necrohol of Nabudis will surely be hell on your first visit, so, unless you map out a strategy to avoid all the enemies, it’s preferable to gain some levels first and come back for your treasure later. Certainly, these tricks aren’t the cleanest ones around. But hey! It’s your strategy, it’s your style and, most importantly, Final Fantasy XII: The Zodiac Age will be your game. And you play the game the way you want. Final Fantasy XII: The Zodiac Age will be released on July 11, 2017. Source: Links to the YouTubers have been added directly in the article. The Zodiac Spear is no longer the strongest weapon in the game in this remaster, and the whole opening one of the four chests removes the Zodiac Spear from the game is no longer true in this version. How do you know that before the release of the game? Source?